How to Make Windows Installer Work In Safe Mode. 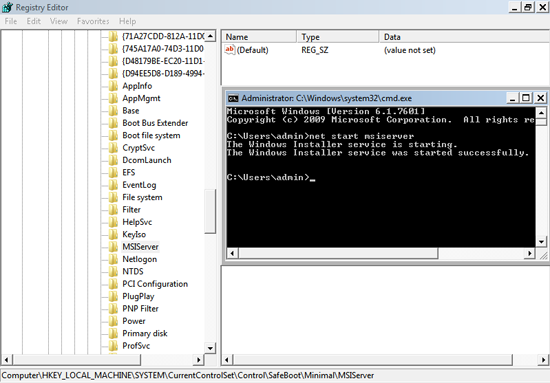 Home » Microsoft » How to Make Windows Installer Work In Safe Mode. Quite why Microsoft have it disabled I don’t know. But to enable it you need to do the following. Option 1 (If you are in “Safe Mode”). Option 2 (If you are in “Safe Mode”). I had a problem doing this with a Windows 7 machine the other week. So instead I simply ran the following .reg file. Allow install in safe mode. Option 3 (If you are in “Safe mode with Networking”).